I spent last week in Vienna working on my research and avoiding the Wiener Staatsoper (you remember what happened at our last reunion?). 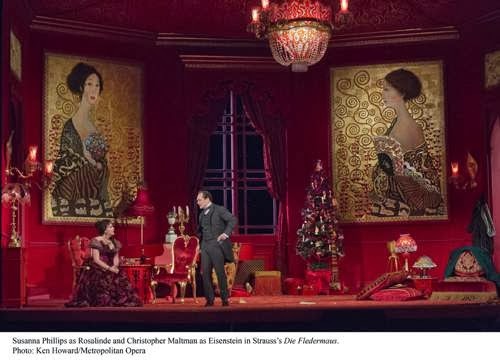 So it was a little funny to return to New York only to go see that most echt-Viennese of works, Die Fledermaus, now in a new production at the Met. There was, however, very little Viennese about this performance–which isn’t a problem in and of itself. The problem is that it is boring, unfunny and musically not very good. The production is moved up from 1874 to New Year’s Eve 1899, to transmit a society on the brink of changing many digits in their date. The setting is also moved to Vienna. * This seems to be purely an aesthetic choice, because 1900 costumes are more glamorous than those of a few decades earlier. (If the date is actually supposed to mean something apocalyptic, I would suggest claiming that it is July 27, 1914.) It’s a visually striking Jugendstil production (designed by Robert Jones) that isn’t afraid to cut the Met’s vast stage into a living room size, features some fake Klimts in Act 1, an impressive Seccession dome in Act 2 (see above), and a vaguely Otto Wagner-like jail in Act 3. It’s opulent and, in the Met repertoire, unique in its look. Yet nothing in the performances and text are as classy as this design. Because the new text is bad. Jeremy Sams’s English lyrics and Douglas Carter Beane’s new dialogue are long-winded–the dialogue goes on for ages, and the lyrics pack in way more syllables in than the music seems to want–and terribly confused in terms of tone and setting. They mix a casual, contemporary tone (“One pig’s head coming through!”) with second-rate Downton Abbey period style and lots and lots of Gilbert and Sullivan couplets. The lyrics’ rhyme schemes and repetition don’t respect the music’s phrase structure, and many of the best lines are completely left out (“Glücklich ist, wer vergißt, was doch nicht zu ändern ist”–Alfred’s toast, “Happy are those who forget that which cannot be changed”–is now “long ago and far away… [something else along the lines of ‘don’t you remember, dear’]”). The end result is that the production, like Adam Fischer’s unfortunate conducting, doesn’t seem to be located in any place at all. 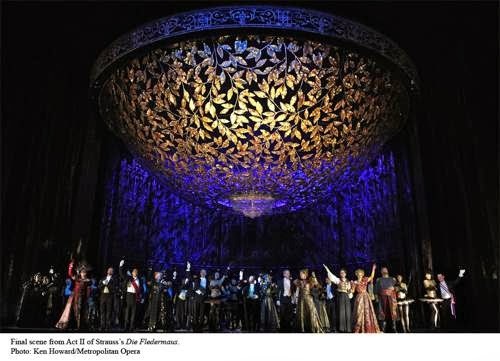 The consistent disregard for fin de siècle tone and manners moves the text away from the period depicted visually, but nor are the contemporary bits strong enough to put it in our day either, and it ends up in the kind of no-place that exists solely onstage at a major opera house. The cast can’t even agree if “Eisenstein” is to be pronounced like it is in German or in English. Like Sams’s previous Met concoction, The Enchanted Island (returning to the Met this spring, God help us all), it is distant from any recognizable social world or human feelings, because apparently it’s more FUN when we forget about that kind of messy stuff. There’s no heart in any of the characters, and no creative impulse, only smug superficiality. The reconciliation at the end has no resonance whatsoever. I felt like someone was screaming at me, “You’re having fun! You’re having fun!” I wasn’t. There is simutaneously a would-be subversive gay humor element in Orlofsky that ends up turning out as a cape-twirling caricature. One has to wonder how much subversion is going on when the stage is simlutaneously decorated with (fake?) unclothed chorus girls. (Similarly, the casting of a man as Orlofsky is much less disruptive than a woman would be.) This is a production that wants to be outrageous without offending anyone, which doesn’t really work. Anyway, all this might have been improved if the cast had been more adept at selling the weak text, but they’re opera singers and not actors and you can tell. Adam Fischer’s conducting never waltzed, lacking any idiomatic sense for Viennese dance rhythms and making the champagne more or less flat. Nor did the singers seem to be, mostly, well-cast. 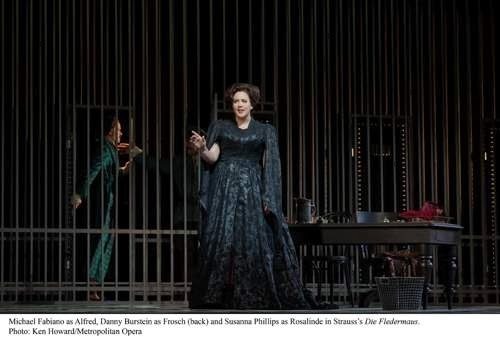 Susanna Philips has a sweet, winning presence, but she lacks the pizzazz and jaded diva quality for Rosalinde. While her silvery soprano is the right sound for the music, she struggled with the higher passages and particularly the csárdás. Christopher Maltman was a not particularly charismatic Eisenstein (with a British accent hiding just under the surface) and, like most baritones, found the role too high. Paulo Szot sounded growly as Falke, nor was he as naturally charming as he usually is. 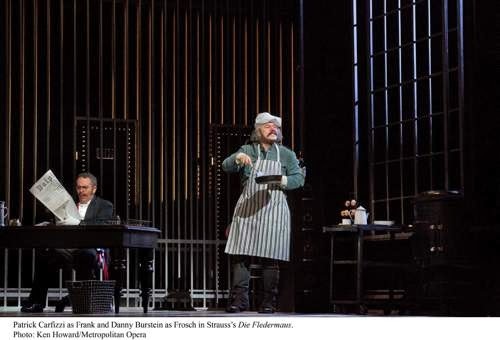 Patrick Carfizzi sang very well as Frank. You might have a nice ‘Maus if you were to take this sets and costumes and restore Haffner and Genée’s original text and redo the Personenregie. Or you could even adopt David Pountney’s widely-used, mostly totally OK English translation. (It’s on this Glyndebourne DVD.) Maybe consider this for the first revival, Met? 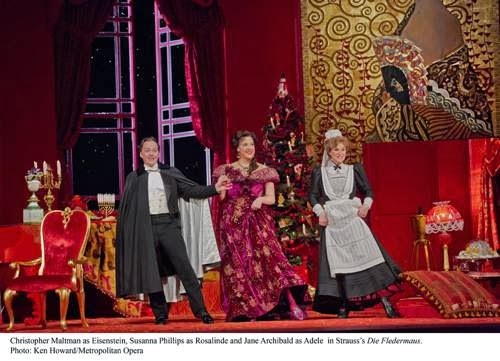 Die Fledermaus continues through February. If you want a culturally perceptive Fledermaus on DVD you really should try Hans Neuenfels’s brilliant 2001 Salzburg deconstruction; if you want a stellar performance of the score you need the Carlos Kleiber DVD from Munich. 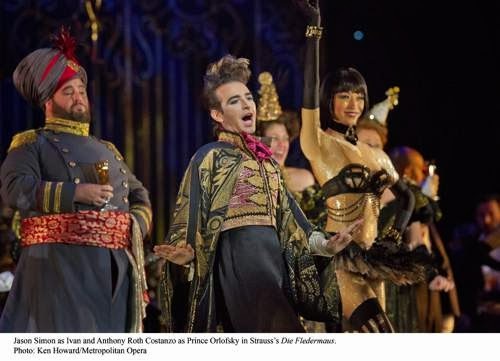 I do not wish to reproduce Chapter 1 of my dissertation in this space, but program notes author Jay Goodwin’s characterization of the source material’s French heritage as “ironic” and as its French background as needing to be “washed away” misdates the anti-French backlash in Viennese theater. For the Viennese in 1874 (when Fledermaus premiered), operetta was French and a French-ish source with the dramaturgy of French boulevard theater was only to be expected. While some anti-French sentiment had already been brewing, it didn’t really catch on in theater production until around a decade later. The founding text of the anti-French nationalist backlash, Adam Müller-Guttenbrunn’s “Wien war eine Theaterstadt,” wasn’t published until 1885. 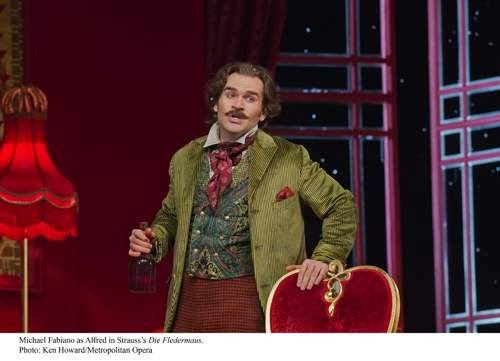 Godwin also oversimplifies his description of Offenbach, who was not a wholly novel foil for large-scale opera as stated but rather refreshed a pre-existing tradition of Volkstück, Schwank, and komische Oper. He also mistakenly states the operetta’s setting as Wien, when it is a “Badort in der Nähe einer großen Stadt,” as mentioned in my footnote below. 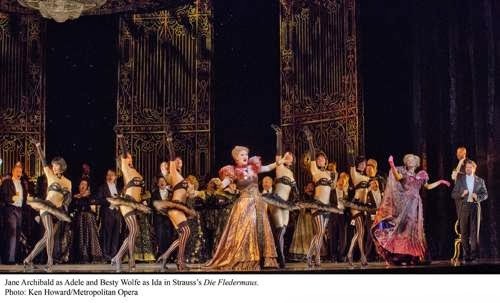 *You might also be interested to know that Fledermaus doesn’t originally take place in Vienna! It’s set in a spa town “near a large city,” probably meaning Baden bei Wien. That’s why Orlofsky is there–he’s taking the waters to cure his ennui. Could you possibly give a more detailed opinion on the neuenfals production? id love to see it but the few clips I've been able to find are incomprehensible, and I like neuenfals' productions for the most part. I tried to listen to the radio broadcast a couple of weeks ago. I only made it as far as the first interval. I really think I am completely allergic to Jeremy Sams. I thought Enchanted Island was bad but this was physically painful.